Just a few days before I went for watching ‘Nadigayar Thilakam’, I stopped my surfing TV channels when I accidentally stuck on the song ‘Andru Oomai Pennallo’ featuring Savitri and Kamalhassan; I stopped for a while to watch Savitri and the film I very well remember. It is a multistarrer ‘Paarthal Pasi Theerum’, indeed, a flop. Savitri was a in a way arresting with her thick hair in a loose plait and in a dark color saree and blouse; she was bulky, and anyway all her costars were rotund and bulky equally or still worse. What made me linger and watch was her radiant, expressive face and the song. It was half of the movie and I watched it till its end and one cannot but refute that Savitri fit perfectly into that genre of (over) acting but with some integrity. So when I read the glorious biopic on her ‘Mahanati’ in Tamizh ‘Nadigayar Thilakam’ I resolved to watch it. The stills I saw were in fact impressive. I wanted to see how a fragile looking Keerthi Suresh had been transformed into a carpulent star of yesteryear. The movie belonged to the director Nag Ashwin, Keerthi Suresh and Dulquer Salmaan in that order. The boring start, slightly interesting romantic middle and, a depressing dreary lead to climax form the movie. Since original is basically in Telugu the brief appearances of NTR, ANR and Ranga Rao are there but her Tamil successful costar Sivaji Ganesan did not figure on screen and only in dialogue. I was definitely impressed by the sterling performance of Keerthi Suresh whom I haven’t seen so far on screen. She had almost donned the role of an actress who was a couple of generation probably before her birth. She was wonderfully made up to look like Savithri. 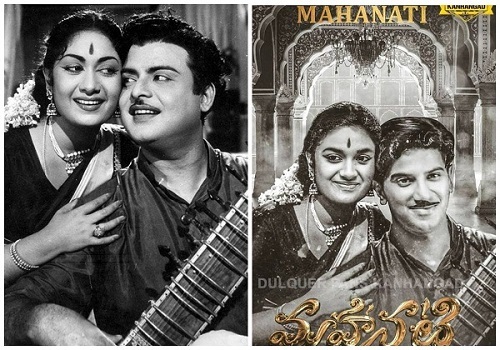 Though not in the first half, in the second she was more close to Savithri, we the older generation was familiar with. But, unfortunately Savithri’s life history is of many knowingly courted blunders. Her marriage with Gemini Ganeshan and later her separation, her wrong indulgences into film production, her financial crisis, her addiction to alcohol are all pathetically justified by juxtaposing with her soft heart and magnanimity. They are honestly hardly convincing (to me). It is superfluous to comment on the brilliant technicalities of present day movies. A breezy romance of a Brahmin reporter (Samantha) and a Christian photographer (Vijay) is infused as garnishing. It will be uncharitable to conclude without mentioning about Dulquer Salmaan who had convincingly portrayed the role of a philanderer with ego. He is superb!